With silver claws and silver eye. A mouse (plural: mice) is a small mammal belonging to the order of rodents, characteristically having a pointed snout, small rounded ears, and a long naked or almost hairless tail. The best known mouse species is the common house mouse (Mus musculus). It is also a popular pet. In some places, certain kinds of field mice are also common. They are known to invade homes for food and occasionally shelter. Robert Burns,To a Mouse, st. 7 (1785). Walter de la Mare, Silver. Jeffrey Moussaieff Masson and Susan McCarthy, When Elephants Weep: The Emotional Lives of Animals (London: Vintage, 1996. ISBN 0-09-947891-9, Conclusion, p. 217. We cannot model everything in the mouse. If we want to move stem cell therapies from the lab to clinics and from the mouse to humans, we need to understand what these primate cells can and can't do. We need to study them in humans, including human embryos. Consider the little mouse, how sagacious an animal it is which never entrusts its life to one hole only. Plautus, Truculentus, Act IV, sc. iv, l. 15. When a building is about to fall down, all the mice desert it. Pliny the Elder, Naturalis Historia, Book VIII, Section 103. Beatrix Potter, The Old Woman. Christina Rossetti, The City Mouse and the Garden Mouse. Mice are the key model we use to study mammalian development and we extrapolate from mice to humans. This work tells us that the extrapolation can be unreliable. I’m not saying that all work in mice doesn’t apply in humans, but there are fundamental differences we need to be wary of. Quotes reported in Hoyt's New Cyclopedia Of Practical Quotations (1922), p. 533. That hath but oon hole for to sterte to. Geoffrey Chaucer, Paraphrase of the Prologue of The Wyves Tale of Bath, line 572. George Herbert, Jacula Prudentum (1651); see Plautus, Trunculentus, IV, above. 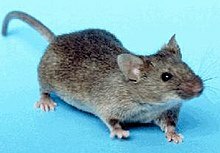 A wylie mouse that should breed in the cat's eare. John Heywood, Proverbs, Part II, Chapter V.
Lorenzo Pignotti, The Mouse Turned Hermit. Alexander Pope, The Wife of Bath, Her Prologue, line 298. William Shakespeare, Coriolanus (c. 1607-08), Act I, scene 6, line 44. If an elephant has its foot on the tail of a mouse and you say that you are neutral, the mouse will not appreciate your neutrality. The early bird may catch the worm, but the second mouse gets the cheese.